Candy lovers take note, this is a recipe you must try! 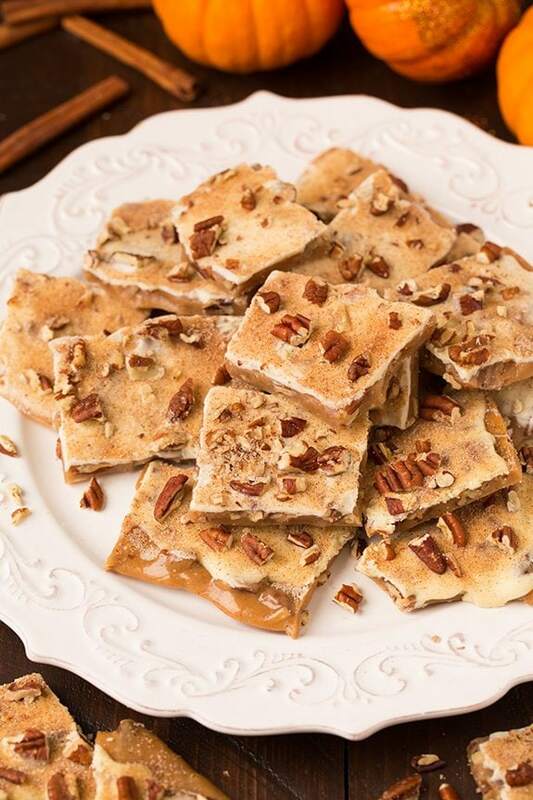 This Pumpkin Spice Toffee is some of the best toffee I’ve ever had! 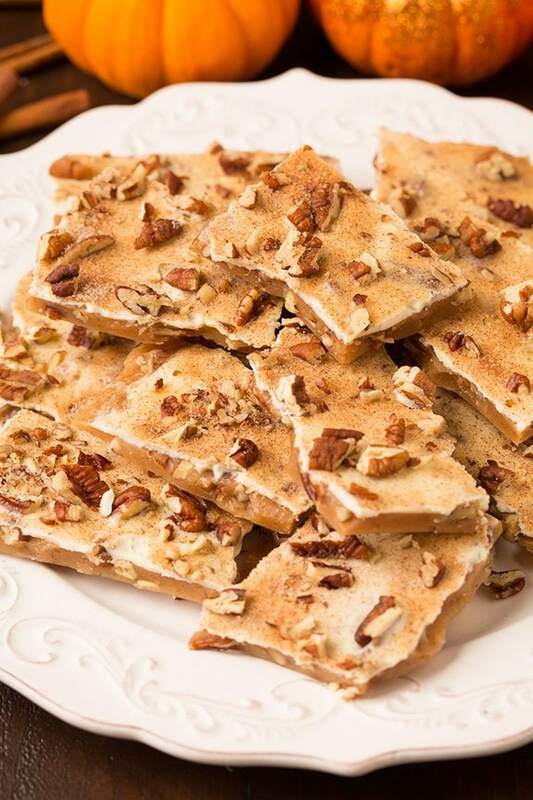 It’s packed with pecans, swirled with pumpkin pie spice, covered with white chocolate and sprinkled with cinnamon sugar to create a batch of seriously irresistible toffee that just has Fall written all over it! The recipe comes from one of my new favorite cookbooks Sally’s Candy Addiction written by Sally McKenney, writter of the incredibly popular food blog Sally’s Baking Addiction. Sally’s blog is one of my absolute favorites, I’ve been following her blog for about 4 years now. You can tell she just pours her heart into everything she makes and she is so incredibly talented! The photos in this cookbook are gorgeous and you’ll find an accompanying photo for each recipe, which I love. It’s so nice to be able to see what the outcome is rather than guessing what exactly it is you’ll be making. 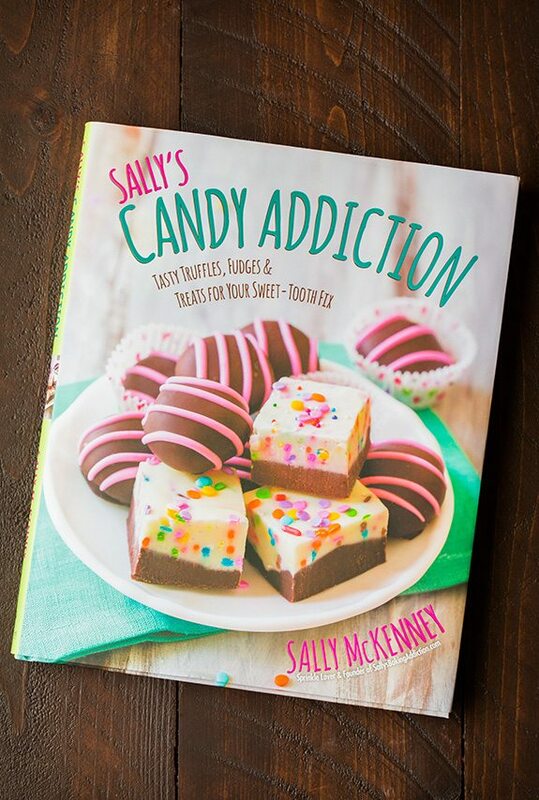 This is her second cookbook, if you love this one you’ll also love her first, Sally’s Baking Addiction. As soon as I got this book in the mail I scoured it over because I couldn’t stop swooning over all the deliciousness on every page inside! You can only imagine the number of bookmarks I had in it and how hard it is to choose what to make first, my kids were having a hard time helping me choose too! I’ve absolutely loved candy as long as I can remember so this book has my name written all over it! 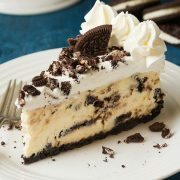 It has all the perfect recipes for the sweet tooth in all of us. This book is so straightforward and easy to follow, which I love, because candy making can be so tricky and unforgiving. If candy making has been something you don’t dare venture into, this book will help you find so much more confidence that you can do it and do it well! In this book you’ll find everything from the classic candy recipes like your Grandma made to those loaded with candy bars, and of course those dunked in a generous coating of chocolate – which she’ll teach you how to temper in the book so you can get that perfect melt-in-your mouth texture. I’d give you the list of all the recipes from this cookbook that I can’t wait to try but I’d just have to list out the whole book! Some of the ones that first caught my eye are Strawberry Buttercreams, Southern-Style Pecan Pralines, Saltwater Taffy, Mint Truffles, Vanilla Cake Pops, Nutella Truffles, Salted English Toffee, Lemon Cream Pie Truffles, Chocolate Sea Salt Caramels, Snickers Cheesecake and Birthday Cake Fudge. If you’d like to order a copy for yourself you can order it on Amazon HERE. Trust me this is a cookbook you don’t want to miss out on! You’ll love this book and it would make for the perfect gift for the holidays to give to your friend or loved one! 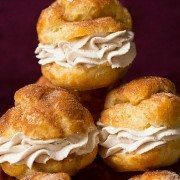 More Delicious Treats To Try! Deliciously buttery, melt-in-your-mouth toffee that's brimming with sweet pumpkin spice flavor and finished with creamy white chocolate and crunch pecans. A perfect recipe for gifting! Preheat oven to 300 degrees. Line a large baking sheet with parchment paper and a 12 by 17-inch jelly roll pan with a silicone baking mat or lightly grease with butter. Spread the chopped pecans evenly onto parchment lined baking sheet and toast in preheated for 7 - 8 minutes, or until very lightly browned. Set aside. Melt butter in a 3-quart heavy bottomed saucepan over medium heat, stirring occasionally with a wooden spoon (about every 2 minutes). Once butter has fully melted, add the water, 1 cup (200g) of the sugar, salt and corn syrup. Stir constantly until the sugar dissolves, then brush down the sides of the pan with a wet pastry brush. Attach a candy thermometer to pan, without letting it touch the bottom of pan. Once the sugar has dissolved, bring mixture to a boil. Rapid bubbles, a thicker consistency, and a slightly darker color form around 235°F (113°C). Stir lightly once every minute until candy reaches 290°F (143°C). 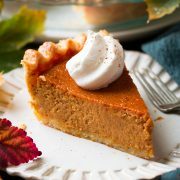 Remove pan from heat, stir in pumpkin pie spice and 1 cup of the pecans. Pour toffee onto baking sheet lined with silicone liner. Smooth into an even layer with a wooden spoon (toffee should be thick and won't spread to edges of pan). Allow toffee to cool for 5 minutes. Meanwhile in a small bowl whisk together cinnamon and remaining 2 Tbsp (25g) sugar. Sprinkle white chocolate evenly over slightly cooled toffee and allow white chocolate to rest until it has melted then spread into an even layer. Sprinkle the top evenly with remaining pecans and cinnamon sugar mixture. Refrigerate for 20 minutes, or until white chocolate has set. Once set, remove from refrigerator and cut or break into pieces. Store in an airtight container at room temperature up to 2 weeks or freeze up to 3 minutes. 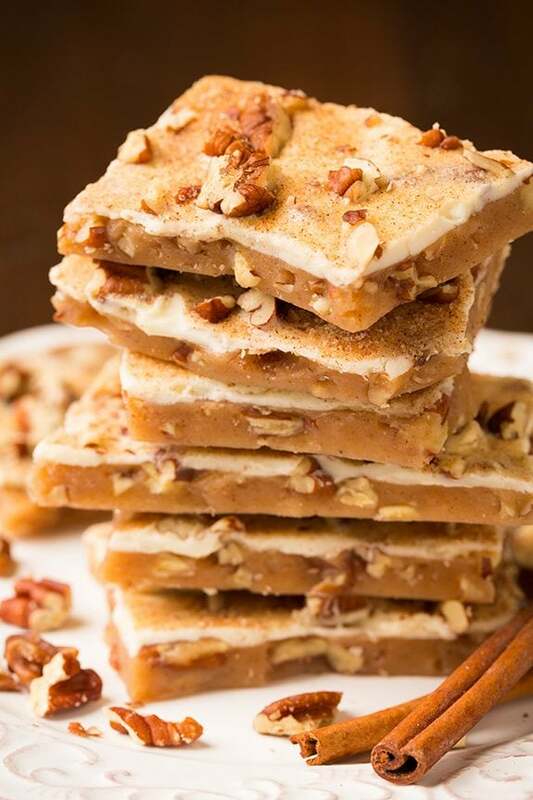 Recipe from Sally's Candy Addiction, pg. 108. Kelly: This looks and sounds AMAZING!